Western Bays Epic Full Day package is without a doubt for the truly adventurous and requires a good level of fitness to enjoy the day to its fullest. And what away to experience the spectacular scenery from the Great New Zealand Cycle Trail (and where else in the world do you get to ride down a waterfall?) 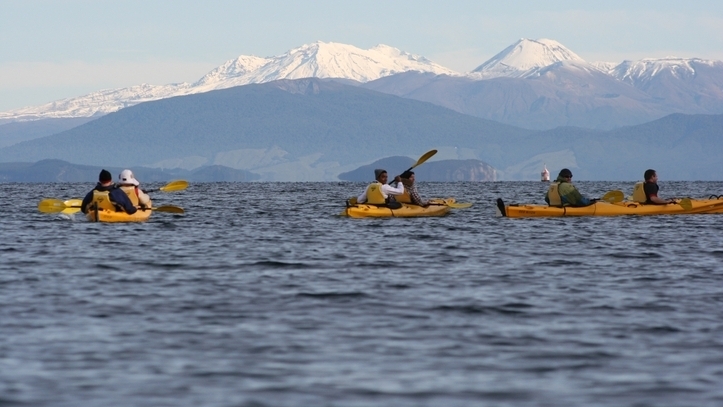 and see phenomenal views of the stunning Lake Taupo region by water. In one day, you will enjoy an amazing 3 - 4 hour mountain-bike ride and a 3.5 to 4 hours kayaking on the crystal clear waters of Lake Taupo. You will meet us at our base in Acacia Bay, where we will load your bike then set off by road to the Waihaha section of the Great Lake Trail to begin your riding leg of the Waihaha and Waihora sections of the Great Lake Trail down to Kotukutuku Steam. you’ve crossed the river you will start climbing gently up onto the cliffs above, following the course of the river to the sign that marks the start of the Waihora trail junction. This trail has breath taking views of the Waihaha River canyon and waterfall (a must see hidden gem of the Western Bays of Great Lake Taupo). It is surrounded by lush native bush including Tanekaha (Celery Pine) which is endemic to this region of the North Island. You will also see large outcrops of ancient volcanic rocks along the trail. many climbs and switch-backs but you will get to ride some of the best flowing downhills you have ever experienced as the trail allows you to free roll around sweeping corners and bends at top speed. Feel the flow! As you descend towards the lake, you will reach a unique engineering feat of bridges, platforms and boardwalks that will take you over the Kotukutuku Waterfall and out onto the beach at the beautiful and peaceful Kotukutuku Landing (a tranquil bay). Where else in the world do you get to ride down a waterfall?! eruption of 1600AD, causing them to form into harder rocks when they cooled. 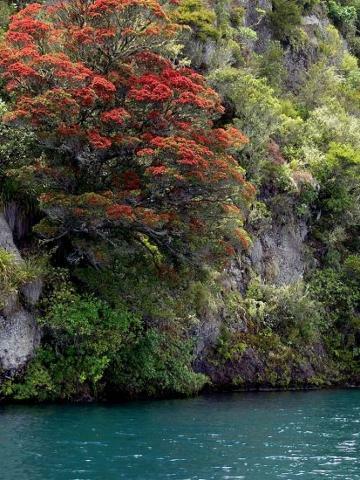 At the Kotukutuku Landing (a tranquil bay) you will be met by your Kayak guide who load you bike on boat transporter. After a gourmet lunch stop in Kotukutuku landing, your guide will equip you, so we can set off on our kayaking journey. You then enjoy a 3.5 to 4 hour paddle via Boat Harbour, across Kawakawa Bay and the spectacular volcanic rock / cliffs emerge from the clear blue/green waters around the point into Whangamata Bay and the lakeside village of Kinloch. This trip will generally only run during summer time (daylights saving in NZ). This trip is able to be sorted by starting you ride at Waihaha road end and missing the first 13km Waihaha section.